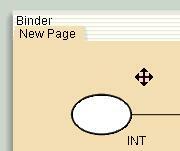 To move a binder, press and drag with one of the cursors in the striped area in the top or bottom of the page. To resize a binder , click and drag the lower right corner of the binder (the area with the small gray triangle). The position and size of the binder are saved when you save a model. To pan the contents of a page, press and drag on the background (the yellow area) of the page with the left button. To zoom the contents of a page, select one of the zoom tools in the View tools palette and apply it to the background (yellow area) of the page. Both zoom and pan is saved together with the binder information when you save a model. To resize a node click and drag on the edge of the node and drag it to the desired size.